My all time favorite snack and my childhood weekend morning breakfast was this Gujarati dish. Every Sunday morning, we used to get fresh Jalebi, Dhokla, Khandvi, Kachori etc. from the Halwai's shop. This soft fluffy Dhokla is savory cake and tempts us to eat more and more without guilt. I, for some reason, thought that preparing Dhokla myself could be a big hassle and I usually bought instant Dhokla readymade mixture from store. But still I couldn't resist making it by myself. I then tried this recipe all by myself and it came out very well. No need of grinding, steaming, hassle free snack and oil free with just a soaking time of 20 minutes. Preparing this dish yourself should make you especially feel happy. As this Dhokla goes well with breakfast, snack, appetizer and surprisingly easy to make this in the microwave. To start with the ingredients given in Dhokla Mixture, take gram flour and semolina in a bowl. Start adding water slowly and mix to make a batter without any lumps. Consistency of the batter should not be too thick or too thin. Now add lemon juice, grated ginger, sugar and salt to the batter and mix properly. Let this batter sit for 20 minutes to become puffy. Meantime, for making Dhokla, grease the microwave safe bowl with oil. Once soaking time is over, add Eno fruit salt to the batter and stir it quickly and properly. You could notice size of the batter might increased to double size and puffy. Immediately pour this batter into oil greased microwave safe bowl. Cover it with a lid and place the bowl in microwave and cook for exactly for 3 minutes on high power. Give standing time for other 2 more minutes to sit in microwave. After removing the bowl, check the batter by inserting a toothpick. If toothpick comes out clean and with out sticking. Adjust to cook further 30 seconds or 1 minute, if the batter is not cooked. Now, microwave Dhokla is ready. Take oil in a pan and place it on the the medium flame. Now add mustard, sesame seeds, curry leaves and saute for few minutes. Then add green chilli as well. Add 1/4 cup water and sugar melts completely. With the help of knife run around the Dhokla for separating it from bowl. Cover the bowl with a plate and flip it. 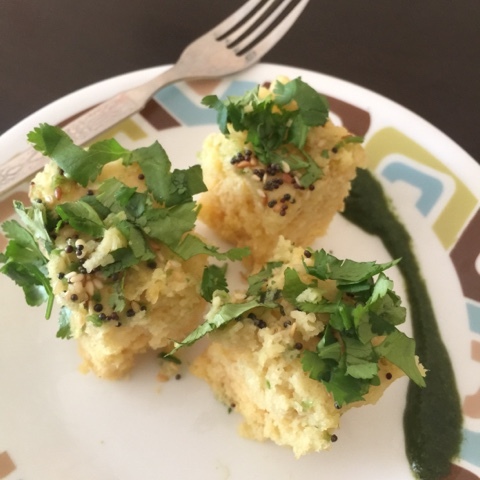 Run the knife over Dhokla gently to make cube shapes. Now pour the seasoning water on Dhokla pieces with the help of a spoon. Dhokla absorbs the water and becomes soft. Garnish with coriander and coconut. Microwave Dhokla is ready. You could add either green chilli or chilli paste instead of whole. Only for microwave the batter needs to sit for 20 minutes, otherwise for steaming or pressure cooker method no need to keep the batter to sit. Steam it immediately, once the batter is ready and the proportion are same.